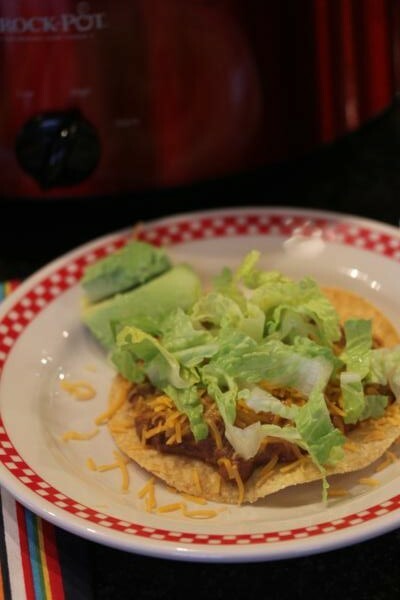 Crock pot tostadas are an easy meal that my family loves. 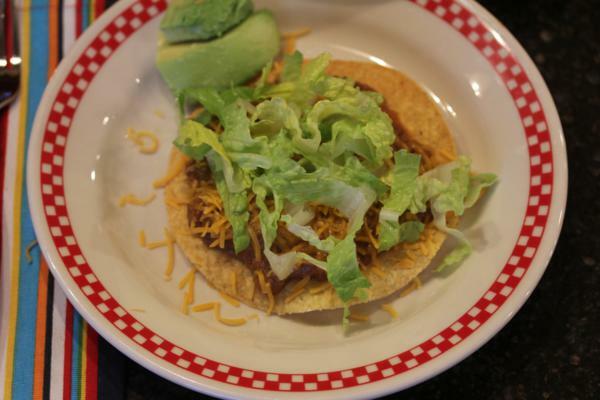 Today’s recipe for my Cooking Through My Collection series is for easy crock pot tostadas. This is a recipe that I have been making for years and it comes from the cookbook Fix-It and Forget-It. The fact that I own three Fix-It and Forget-It (Affiliate Link) cookbooks probably shows a little about me and my age. I am guessing that many of you that are in your 30’s, 40’s, and maybe even 50’s have the same cookbooks. They were very popular back around 2000. I think at one time is was the bestselling cookbook. What I love about these cookbooks is the wide variety of recipes in them. There are easy recipes, more complicated recipes, recipe for pork, chicken, beef, vegetables, and even desserts. It is all covered. What I don’t like so much about these cookbooks is the amount of processed food that some of the recipes use. Many of the recipes are basic recipes, using regular, more whole foods type things, but some do call for things like cream soup, canned soup, instant mixes, etc. Overall I do love and recommend the Fix-It and Forget-It (Affiliate Link) books for those looking for new crock pot recipes. There are many recipes in the books that I have been making for years. This tostada recipe that I am sharing today is one of those recipes that I love and make all the time. It is easy to make and contains ingredients that I almost always have on hand. I also like the fact that these work as tostadas, but can be used as a burrito filling, for nachos, and more. Now for those of you that own and love these cookbooks I would love to hear your favorite recipe or recipes from the books. I know some of you will have some. In a skillet brown ground beef and drain off any fat. Place ground beef in slow cooker and add refried beans, taco seasoning, and water. Stir to combine. Serve on tostada shells with lettuce, cheese, etc. Although I cannot find my cookbook to be sure common I am pretty certain this also called for an 8 ounce can of tomato sauce.